As easy as 1, 2, 3…. A healthy, tasty treat for children going back to school. Even if they are not too keen to eat fruit as part of their 5 a day, the chocolate should encourage them to try this. I have used Swiss dark chocolate because the contrast with the fruit is greater but also because it is healthier than white or milk chocolate. These little lollipops can be made with plums which are abundant in this season. 1. Rinse the apricots and pat them dry with a kitchen towel. 2. Slit one side of each apricot and remove the stone delicately. 3. Insert a small plastic spoon in each apricot so that the rounded part nestles where the stone was. 4. Melt the chocolate over a “bain marie” ( break the chocolate into small pieces and place in a Pyrex bowl over a saucepan containing boiling water, stirring all the time with a wooden spoon). 6. Turn off the heat and dip each apricot in the chocolate then let them dry before serving. 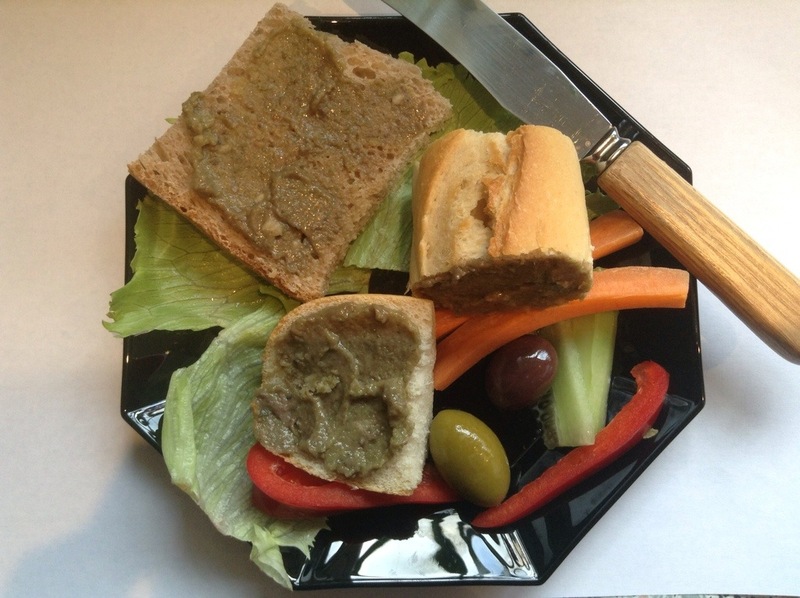 Here is another childhood memory dish which is a classic of the healthy Mediterranean diet. Great uncle T. who was a philosopher and had sailed the Seven Seas, used to call it ” little black patent shoes” because the very shiny aubergine skin can be such a dark purple that it looks black. We knew what treat was in store when he mentioned the little black patent shoes that great aunt M. had prepared. This is a family favourite and ensures that children eat a variety of vegetables in a fun way. For a vegetarian version, replace the bacon with the flesh of the aubergines and tomatoes. 1. Pre-heat the oven at 200C. 2. Rinse the aubergines and steam them briefly. 3. Meanwhile, whizz all the ingredients in a food processor. 4. Check that the aubergines are still firm and cut them in half lengthwise. 5. Scoop out the flesh delicately with a tablespoon. 6. Place the aubergines in a lightly greased oven-proof dish. 7. Lightly cook the stuffing in a non- stick frying pan without oil (the bacon will provide sufficient fat). 8. 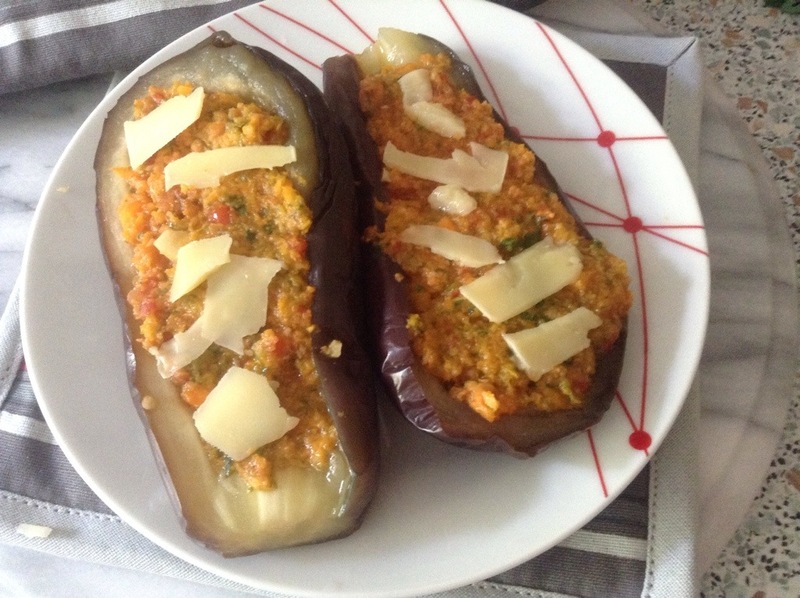 Fill the aubergines shells and sprinkle the parmesan on top. 9. Cover with foil and put in the oven for 20 minutes At 200C. This can be a main dish or an accompaniment to a roasted meat. As a delicious stater or to serve with an apéritif, this spread is easy to make. 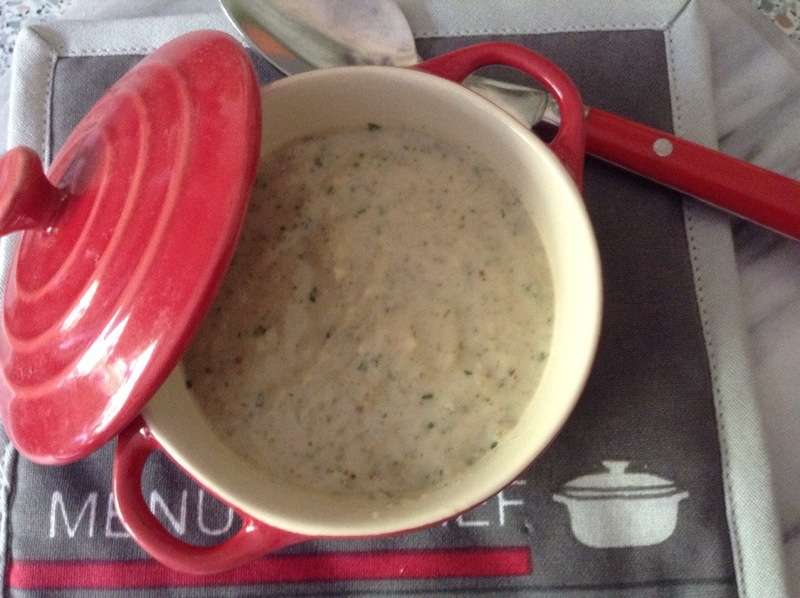 Whizz the anchovies and the butter in a food mixer and spread on bread. 2. Using a grapefruit knife, cut out the top of the tomato and scoop out the flesh. reserve the flesh to make a juice or a sorbet. Reserve the top of the tomato as well, for decoration. 3. 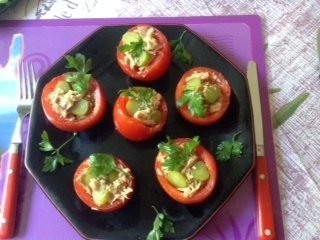 Fill in the tomato with the tuna, sprinkle with lemon juice and olive oil and decorate with the top of the tomato, as a hat. 1. Whizz the tomato flesh in a liquidizer. 2. Sieve the mixture in a fine mesh sieve. 3. Add some strawberry syrup. 4. Pour into a sorbet maker and follow manufacturer’s instructions. If you not use a sorbet maker, pour the mixture into a metal ice cube tray and freeze for 1 hour. 5. Take out of the freezer and scrape the iced tomato with a fork to break up the icicles. 6. Serve in cooled sorbet dishes and decorate with fresh mint leaves. To prolong the holiday feeling, I decided to re-create a delicious dish we ate recently in Corsica. The very talented chef, Jean-Pierre, called it a Tarte fine de Fondue de Poireaux aux Saint Jacques. This was served as a starter but I made it as main course, so I was a little generous with the scallops. 2. Slice the leeks in half and cut into rings. 2. Heat up the oil in a non-stick frying pan and sweat the leeks until tender. 3. Add the wine and continue cooking for 1 minute until the wine is totally absorbed. Reserve in a warm dish. 4. Cook the scallops for 1 minute in a non-stick frying pan. Reserve. 5. Roll out the pastry and line a 20cm round oven-proof dish. 6. Place in the oven and cook for 15 minutes. 7. Take out and garnish with a thick layer of leeks and the scallops, making sure both leeks and scallops are dry to avoid making the pastry soggy. 8. Put back in the oven for 5 minutes. 9. Take out and serve immediately .